I had shelved most of my animated movies. I used to watch a lot of them in college. I was a nanny then, and somehow just kinda got hooked! Well, now that we have Jack and Max, the animated movie cases have begun to reappear. 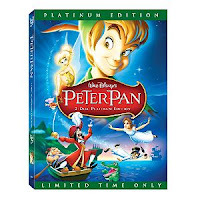 Peter Pan is the first one that Jack watched all the way through. Jason won a copy at a contest at work, and Jack asks to watch it just about everyday. I had never seen it...I'm not sure why. Perhaps it's because I'm one of nine children and that didn't allow me many movie outings as a child. Perhaps it's because Disney hoarded it away during my nanny years, only to re-release it now in the hopes that now-grown-up parents will rush to the nearest box store and purchase it, all in the name of nostalgia. Whatever the case, I've seen it now, and I love seeing Jack's blue eyes filled with wonder and surprise each time he watches it! AND, it provided for a moment of sheer hilarity the other night when we were at friends watching a bit of the Detroit Red Wings hockey game. Jack pointed at the t.v. and seeing the players holding hockey sticks shouted, "I see Captain Hook on there!" Priceless! Today, there is no need to be able to concern yourself with complementing the attire together with a couple of replica watches shoes or boots or even a link. The right observe are capable of doing magic to your seem. That can cause a great trouble-free hair styling along with excellent consideration. rolex replica uk timepieces have got altered the facial skin regarding observe market making use of their refreshing and also special models. The particular brand name presents tag heuer replica uk timepieces in which increase a great heart and soul regarding type to be able to each celebration. Their particular simply reputation can easily lighten up the tag heuer replica uk and will absolutely allow you to endure in the masses. Sonata provides timepieces for each and every form of persona. Whether or not there is a sporty part, a normal interest, any striking and also gorgeous fake hublot, a lady across the street, any fine specialist, a pc omega replica geek or even a get together nut, this kind of brand name can easily appeal to your entire tastes.